ELYSBURG — As the old expression goes, when it rains, it pours. In the case of the Etchen family, that phrase is true except for one thing — there is no rain, only shotgun shells. The Etchen name, which has become synonymous with the sport of trapshooting since Fred Etchen, captain of the first American Trapshooting Team, helped lead the squad to a gold medal in the 1924 Summer Olympics, now will have a new honor to add to the family legacy come Saturday — two Pennsylvania State Sportsmen’s Association (PSSA) Hall of Fame inductees. 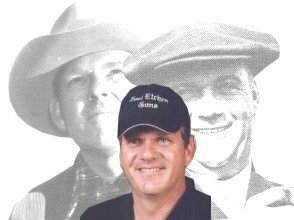 Fred’s son and grandson, Rudy and Joel, respectively, will be the first father and son to be inducted in to the PSSA Trapshooting Hall of Fame. Fred and Rudy were also inducted into the Trapshooting Hall of Fame. Fred was honored in 1979, while Rudy made it into the Hall in 1980, hitting 600 straight targets after a 26-year-lapse in competitive trapshooting. Rudy will be inducted posthumously. He passed away in 2001. The Pennsylvania State Shoot has been like a home away from home for Ligonier’s Joel Etchen for the past 21 years. He has won trophies nearly every year since 1987, including the 2004 Doubles title, High Overall title, AAA High All-Around title and Singles runner-up. He was the Doubles runner-up in 1987 and won the Doubles Marathon in 1990. He has also won the Trap and Field Handicap (1997), and has many AA and AAA trophies in singles and doubles. Etchen started out in the sport at a young age, he says, like most of today’s top marksmen. However, as he got older, he got away from shooting, and didn’t actively return to it until he was 26. In 1983, a friend talked to him about getting out to the Pennsylvania State Shoot. After thinking it over, Etchen followed his friend out to Elysburg. “Where they go, you go,” he said. Etchen doesn’t know where he would be with trapshooting had he decided not to come out. Etchen’s mantle also includes Major Handicap and Doubles Open championships at the Maryland State Shoot, including the 1993 Open Handicap Championship and the 1996 Open Doubles Championship. He’s also claimed the 2002 Open Doubles Championship Open HAA title in Michigan, the 2000 Doubles Championship at the Case Shoot in Bradford, and trophies at the Johnny Mock Shoot from 1982 to 2004 (including the HAA Champion in 1991, 2002 and 2003). Of course, the victories in his arsenal also include other out-of-state tournaments. He won the Class AA Doubles in 1992 at the Eastern Championships, the 25-27 Yard Handicap in 1997 and the Open AA Doubles in 2000. At the Grand American, also known as the “Super Bowl” of trapshooting, Etchen has had a wide range of success. In 1992, he and his father took the Father-Son Championship with a record score of 399x400. On top of that, Joel managed to take home the Class AA title, breaking 200 straight targets, something he also did a day earlier. Joel’s longest run without a missed target is 670. His father’s is 1,026. Joel owns and operates a custom gun shop in Ligonier, something he started as a hobby in 1988 to pay for traveling and expenses. Today, he is the largest Beretta target gun dealer in the country. According to Etchen family history, Joel’s great-grandfather, John, started the shotgun train in motion. He was a market hunter in Kansas, providing birds for fine restaurants and hotels. He trained each of his six sons to do market hunting, but only Fred chose to get into competitive shooting. Obviously, John’s success has parlayed into a long line of talent. Today his great-great granddaughter and grandson, Rebecca and Alex, are maintaining the family tradition. The PSSA Hall of Fame may one day open its doors to this new line of Etchen talent. Read about Joel's accomplishments at the Keystone Open 2010 Shoot! Read about Joel's accomplishments at the 2010 Pennyslania State Shoot! Read about Joel's accomplishments at the 2004 Pennsylvania State Shoot! Read about Joel's Accomplishments at the 2005 Pennsylvania State Shoot! Read about Joel's Accomplisments at the 2005 Pennsylvania Grand! Read about Joel's Accomplishments at the 2005 Eastern Zone! Read about Joel's accomplishments at the Westy Hogan 2005 Shoot!